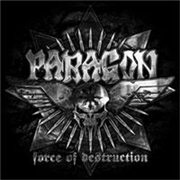 Paragon was founded back in 1990 by guitarist Martin Christian, and debuted in 1994 with “World of Sin”. Since then they have released nine more albums and a couple of EPs etc. Vocalist Andreas Babuschkin has been around since 1990, bassist Jan Bunning since 1997, and drummer Christian Gripp has been in the band since 2006. They seem a solid lineup and for this album they have decided on Piet Sielck (IRON SAVIOR) to produce. This is an album in all simplicity gifted with a solid basic beat and some repetitive refrains that will keep sales at a healthy level. Andreas´s voice is so typical of a German metal band with roots that dates more than 20 years back and sing-along friendly efforts “Iron Will”, “Dynasty” and “Secrecy” will do the rest in getting them festival gigs. The material is too basic to get a fat mark from me, but I still admire their hell-bent attitudes. Piet has sure got them fat sounding guitars, and drummer Christian has his hands full to keep bashing those skins. In true German heavy metal fashion they opt for refrains like “Bulletstorm” and waving riveted fists in the air I think they will have a good year after releasing this one.